Pride and hope were the watchwords at a ceremony today marking the end of production at Janesville&apos;s General Motors Assembly Plant. "I was on the phone at 6:00 AM this morning with the top leadership of the company," said Plant manager Gary Malkus. "I expressed to them how proud I was, and described all of you as dedicated and professional. I couldn&apos;t be prouder of this organization. It&apos;s a said day, but my heart&apos;s bursting with just appreciation for everything you&apos;ve done." John Dohner, Jr. Shop Chairman for United Auto Workers&apos; Local 95, said there&apos;s still hope for the plant. Janesville may still be around," he told the crowd at today&apos;s ceremony. "I&apos;m not trying to get anybody built up on it, but it&apos;s the one thing we can keep in mind, that we can hope." That message of hope was one echoed by Local 95 president, Andy Richardson. "We&apos;re not done yet guys, that&apos;s all I can say, we&apos;re not done yet. It&apos;s been a privilege to represent the best work force in the world," Richardson said as the assembled auto workers cheered. "And we&apos;re not done yet." 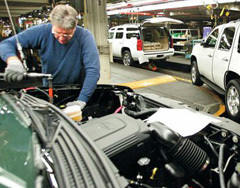 As the last GM SUV rolled off the assembly line today, it marked the end of some 90 years ot automotive production in Janesville, and the end of 1250 jobs at the plant. More than 2000 workers in total are losing work, when plant suppliers are included in the total.